Much of the war metal of the last ten years has sacrificed musicality and memorability in its seemingly unappeasable quest for extremity. 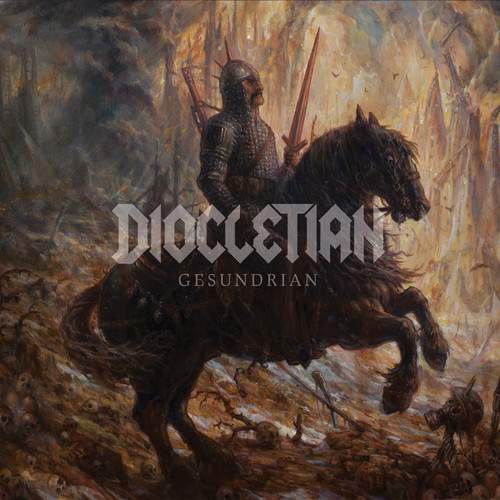 Diocletian‘s third album Gesundrian foams at the mouth with glee, making all the right sounds and gestures, but underneath its vicious exterior lies an emotional void that is hard to ignore. It would take a cynical mind indeed to doubt the band’s intentions for this is genuinely uncompromising death metal with no quarter given nor half an eye out for mass acceptance. But even considering the origins and the general modus operandi of war metal as a distinct style of death/black metal, it feels a bit amiss that Diocletian and bands of their ilk focus so single mindedly on the brutality of conflict without acknowledging the tragedy that goes hand in hand with it. War, after all, might be man’s only endeavour to encompass an absolute spectrum of emotions but you wouldn’t know it listening to Gesundrian. Treated on its own terms, however, Gesundrian certainly is martial in aspect and execution. Moving further away from their origins in the quintessential Canadian war metal sound, Diocletian now show the relative equanimity and restraint of a foot soldier who has survived his first engagements. Incantation have come to gradually replace Blasphemy, Conqueror, and Revenge as primary influence, a process that started on War Of All Against All but now is in full fruition. Tempos show greater variation than ever before while songs seem more comfortable with traditional grotto-like North American death metal structure as opposed to the pseudo-industrial, punkish hyperblast favoured in the past. String harmonics are frequently heard over the course of the record, as is a more willful use of notes down the neck; this is Diocletian venturing out of its comfort zone, embracing the dissonance that finds home in much of modern extreme metal. Unfortunately, in a field overrun with bands doing the same, Gesundrian fails to develop any semblance of identity. The band uses fade ins and fade outs on multiple occasions, an innocuous trope that becomes indictment through pure happenstance, revealing the band’s unimaginative, rudderless songwriting. There is no core holding this album together, resulting in its inevitable collapse once the initial burst of adrenaline has run its course. This entry was posted in Death Metal, Music Reviews and tagged Canada, death metal, Diocletian, Gesundrian, New Zealand, Ross Bay Cult, war metal. Bookmark the permalink.